The history of Carbonnieux goes back a very long way, and records show that wine was made there at least as early as the 12th century. Benedictine monks from Sainte-Croix abbey in Bordeaux replanted and renovated the estate in the 18th century. 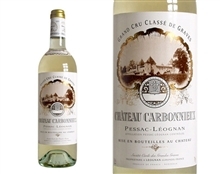 They look advantage of the exceptionally pale, clear colour of the white wine to label is as “Carbonnieux mineral water”, which they then proceeded to ship to the Sultan of Turkey! Marc Perrin acquired and restored the château in 1956. His son, Anthony, currently manages the estate. The gravelly soil at Carbonnieux is perfectly drained thanks to the Eau Blanche stream that carries away any excess water. The 85 hectares of vines are evenly divided between red and white wine varieties. The white wine is fermented and aged in barrel for 10 months. The red wine is aged for 15 to 18 months in barrel, depending on the quality and characteristics of the vintage.